In Acts 3, some followers of Jesus met a lame beggar, at the Beautiful Gate, as the man was asking for alms of those entering the temple. Peter stunned the beggar by saying, “I have no silver and gold, but what I do have I give to you. In the name of Jesus Christ of Nazareth, rise up and walk!” (verse 6). The man was healed, and Peter boldly proclaimed the news that Jesus was and is indeed the Risen Messiah, to those who saw this miracle. and streams in the desert;.. The Beautiful Gate is not directly mentioned elsewhere in the Bible, and unfortunately, scholars are divided as to the exact location of the Beautiful Gate. As the Temple Mount area was largely destroyed in 70 A.D., it is difficult to establish the location with much certainty. However, there are at least one (or two) theories, though I am hardly qualified enough to be sure of them, that tell very interesting stories. Some say that the Beautiful Gate is the same as the Golden Gate, located on the eastern side of the Temple Mount, sitting above the Kidron Valley, across from the Mount of Olives. Though not clearly specified in Scripture, tradition suggests that when Jesus made His triumphal entry into Jerusalem, starting from the Mount of Olives, that He entered the city through this gate, on Palm Sunday (Luke 19:28-44), the beginning of what many Christians call “Holy Week.” Within that following week, subsequent events would lead to the Crucifixion and, finally, the Resurrection of Jesus. Proponents of this theory also suggest that when Jesus returns at His Second Coming, that he will appear on the Mount of Olives again (Zechariah 14:4), and travel the same route he took on Palm Sunday, entering the city again through this same gate, into the temple area. What caught my attention with this theory was something that you will notice about this gate. As you see in the photograph, the gate has been walled off, and sealed shut. This Golden Gate was sealed shut in 1540-41 AD, by Suleiman the Magnificient, an Ottoman Empire sultan. 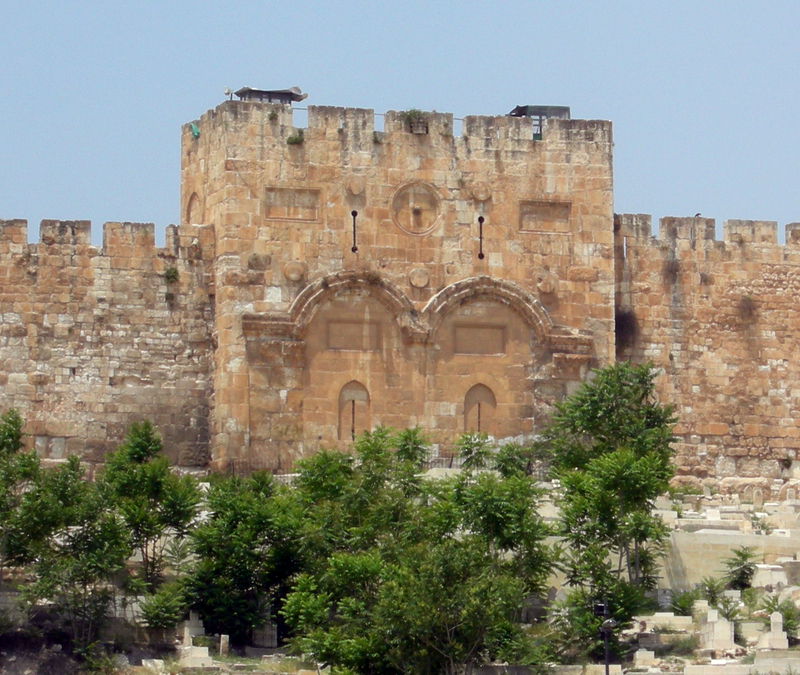 The story goes that Suleiman sealed the gate, and even placed a Muslim graveyard into front of the entrance, in order to prevent the Jewish Messiah from entering the city. Then he brought me back to the outer gate of the sanctuary, which faces east. And it was shut. And the Lord said to me, “This gate shall remain shut; it shall not be opened, and no one shall enter by it, for the Lord, the God of Israel, has entered by it. Therefore it shall remain shut. Many Christians have read this to believe that Suleiman’s actions were actually a fulfillment of prophecy, though he did not realize it. Then when Jesus returns again, the gate will be opened for the returning Messiah (Ezekiel 46:12). Such interpretations are not without their problems. A long standing, older interpretation, going back to the early church, understands that the shutting of the gate in Ezekiel 44:1-2, is about something completely different. A number of early church fathers saw this as Ezekiel’s prophecy regarding the perpetual virginity of Mary, a belief shared today by Catholics and Eastern Orthodox alike, that Mary was not only a virgin before the birth of Jesus, but that she remained a virgin her whole life, as taught here by Saint Augustine of Hippo, in the 5th century AD. But I recently learned that the Beautiful (or Golden?) Gate figures prominently in the apocryphal story of the Annunciation of Mary, to her parents (see below). Not too many evangelical Protestants would accept this particular interpretation today. Well, there is a lot of speculation here, I must freely admit. 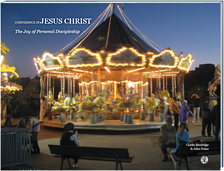 Various Christians have long debated and will continue to debate the details on these matters. Nevertheless, the momentous events during Holy Week, from Palm Sunday to the Resurrection, give us a lot to think about. The entire message of the Bible, from the Old Testament, to the very end of this current age, puts a laser focus on this very special week in world history. No matter where you land on the true meaning, location and history of the Beautiful Gate, where Peter healed the lame beggar, this gate points to the central themes of the Bible that are worth the efforts of our meditation. 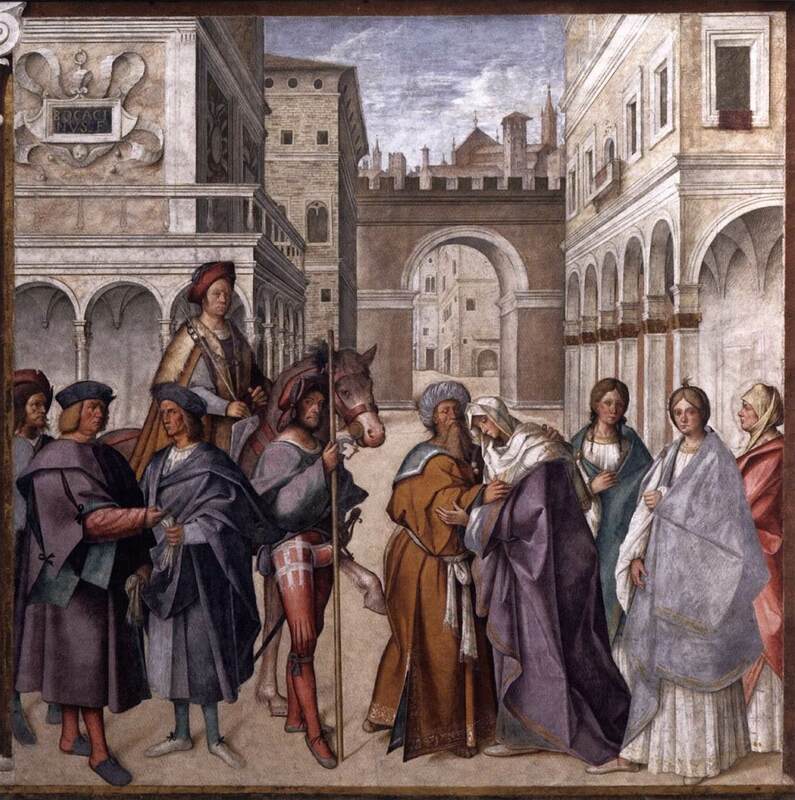 Meeting at the Golden Gate, by Boccaccio, 1514-1515, at Cremona Cathedral. In the New Testament apocryphal literature, the Protoevangelion of James, the parents of the EverVirgin Mary, Joachim and Anna, met at the Golden or Beautiful Gate, after both received a visit independently from the Archangel Gabriel, promising them the birth of their child. Though not a part of the Bible, the Protoevangelion of James was a popular text in the medieval church, for thinking about the life of Mary, the mother of Jesus. (credit: Web Gallery of Art). This entry was posted on Thursday, April 13th, 2017 at 6:40 pm	and tagged with beautiful gate, ezekiel, holy week, palm sunday, second coming and posted in Topics. You can follow any responses to this entry through the RSS 2.0 feed.